Maryland witnessed and experienced fierce "Raids, Operations, and Campaigns", with its most notable Civil War battles fought at Antietam (aka Sharpsburg); Boonsboro; Folck's Mill; Hancock; Monocacy; South Mountain; Williamsport; and Fort Stevens. Introduction: In the American Civil War (1861-1865), Maryland, a slave state, was one of the Border States straddling the South and North. Due to its location and a desire from both opposing factions to sway its population to their respective causes, Maryland played an important role in the Civil War. 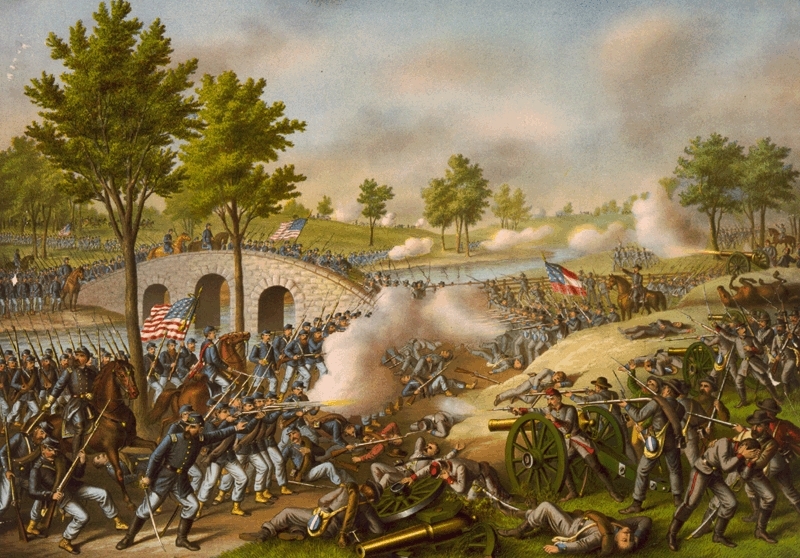 The first fatalities of the war happened during the Baltimore Riot of 1861, and the single bloodiest day of combat in American military history occurred near Sharpsburg, Maryland, at the Battle of Antietam, a strategic Union victory which provided the opportunity for President Abraham Lincoln to issue the Emancipation Proclamation. The 1864 Battle of Monocacy helped delay a Confederate army bent on striking the Federal capital of Washington, D.C.
Background: "After the firing on Fort Sumter by the rebels in April 1861, it became known that troops from the Northern states had been ordered to the defense of the nation's capital, and that these troops would pass through Maryland. The secession leaders asserted that the defense of Washington was but a pretense, the real object of the administration being the military occupation of Maryland in order to prevent its secession." "This rumor still further inflamed the public mind, and when about 2 p.m. on April 18, 1861, six companies of Pennsylvania volunteers arrived in Baltimore, their march from the corner of Howard and Cathedral streets to the Mount Clare station was made through an excited populace, who amused themselves with singing 'Dixie,' cheering for the Southern Confederacy and jeering the unarmed soldiers. No assault was made, but the troops were jostled about by the crowd and greeted by groans and hisses along the entire line of march. About noon on the 19th the 6th Mass. and Small's 'Washington' brigade, of Philadelphia, arrived at Baltimore en route to the nation’s capital. Just before daylight on Sunday morning, April 21, Gen. B. F. Butler arrived at Annapolis with the 8th Mass. infantry, and was joined there 24 hours later by Col. Lefferts with the 7th N.Y."
In addition to the U.S. soldiers arriving by land, others arrived in Maryland by sea. Thereafter, Union frigates and vessels began arriving at Maryland ports and delivered their cargo of additional Union troops. Although Maryland was a 'United State' and had not seceded, President Lincoln had authorized Gen. Scott to suspend the privilege of the writ of habeas corpus, and directed him to arrest or disperse the Maryland legislature in case it attempted any legislation favorable to the cause of secession. "By orders from President Lincoln, Maryland, a free and democratic state, had been overrun by Union soldiers. And under Lincoln's suspension of the writ of habeas corpus, Mayor Brown, Marshal Kane, and several members of the legislature, among them Ross Winans and Coleman Yellott, were arrested and confined in military prisons. Our democracy had been replaced by despotism." On March 6, 1862, Maryland witnessed the passage of the act known as the "Treason Bill," which provided that the penalty of death should be inflicted on any one convicted of levying "war against this state, or shall adhere to the enemies thereof, whether foreign or domestic, giving them aid or comfort, within this state or elsewhere." See also Maryland in the American Civil War (1861-1865). Civil War: According to the 1860 U.S. census, Maryland had a free population of 599,860 and an additional slave population of 87,189. Approximately 65,000* Maryland men served in the Union Army during the Civil War, while nearly 30,000 Marylanders joined the Confederate Army. To help ensure Maryland's inclusion in the Union, President Lincoln suspended several civil liberties, including the writ of habeas corpus, an act deemed illegal by Maryland native Chief Justice Roger Taney. Lincoln ordered U.S. troops to place artillery on Federal Hill to threaten the city of Baltimore, and helped ensure the election of a new pro-union governor and legislature. Lincoln went so far as to jail certain pro-South members of the state legislature at Fort McHenry, including the Mayor of Baltimore, George William Brown. The grandson of Francis Scott Key was included in those jailed. The constitutionality of these actions is still debated. The first bloodshed of the Civil War occurred in Maryland. Concerned about the Confederates capturing the capital, Washington, D.C., President Lincoln ordered troops to defend the city. They were transported by rail to Baltimore, where they had to disembark, march through the city, and board another train to continue their journey south to Washington. As one Massachusetts regiment was transferred between stations on April 19, 1861, a mob of secessionists and Southern sympathizers attacked the train cars and blocked the route. The mob began throwing stones and bricks at the troops. Panicked by the situation, several soldiers fired into the mob, and chaos immediately ensued as a giant brawl began between fleeing soldiers, the violent mob, and the Baltimore police who tried to suppress the violence. Four soldiers and twelve civilians were killed in the riot. This event inspired James Ryder Randall to write a poem which would be put to music and eventually become the state song, "Maryland, My Maryland". After the April 19 rioting, some small skirmishes continued in Baltimore for the next month, but a sense of normalcy returned as the city was cleaned up. Mayor George William Brown and Maryland Governor Thomas Hicks implored President Lincoln to reroute troops around Baltimore city and through Annapolis to avoid further confrontations. On the evening of April 20, Hicks also authorized Brown to dispatch the Maryland state militia for the purpose of disabling the railroad bridges into the city - an act he would later deny. One of the militia captains was John Merryman, who was arrested without a writ of habeas corpus one month later, sparking the case of Ex parte Merryman. Lincoln complied with the request to reroute troops to Annapolis at first. However, on May 13, the Union army entered Baltimore, occupied the city and declared martial law, to prevent all further incidents. The mayor, city council, and police commissioner, who were pro-South, were arrested and imprisoned at Fort McHenry. However, in the case Ex parte Merryman, these actions were deemed unconstitutional. After the occupation of the city, Union troops were garrisoned throughout the state. Several members of the Maryland legislature were also unlawfully arrested, and the state was placed under Federal martial law. During the Civil War, Maryland witnessed two major campaigns: Antietam and Maryland Campaign (September 1862) and the Shenandoah Valley Campaigns of 1864. While Major General George B. McClellan's 87,000-man Army of the Potomac was moving to intercept Lee, a Union soldier discovered a mislaid copy of the detailed battle plans of Lee's army. The order indicated that Lee had divided his army and dispersed portions geographically (to Harpers Ferry, West Virginia, and Hagerstown, Maryland), thus making each subject to isolation and defeat in detail if McClellan could move quickly enough. McClellan waited about 18 hours before deciding to take advantage of this intelligence and position his forces based on it, thus endangering a golden opportunity to defeat Lee decisively. The armies met near the town of Sharpsburg by the Antietam Creek. Although McClellan arrived in the area on September 16, his trademark caution delayed his attack on Lee, which gave the Confederates more time to prepare defensive positions and allowed Longstreet's corps to arrive from Hagerstown and Jackson's corps, minus A.P. Hill's division, to arrive from Harpers Ferry. McClellan's two-to-one advantage in the battle was almost completely nullified by a lack of coordination and concentration of Union forces, which allowed Lee to shift his defensive forces to parry each thrust. In 1864, elements of the warring armies again met in Maryland, although this time the scope and size of the battle was much smaller than Antietam. The Battle of Monocacy was fought on July 9, just outside Frederick, as part of the Valley Campaigns of 1864. Confederate forces under Lt. Gen. Jubal A. Early defeated Union troops under Maj. Gen. Lew Wallace. The battle was part of Early's raid through the Shenandoah Valley and into Maryland, attempting to divert Union forces away from Gen. Robert E. Lee's army under siege at Petersburg, Virginia. However, Wallace delayed Early for nearly a full day, buying enough time for Ulysses S. Grant to send reinforcements from the Army of the Potomac to the Washington defenses. See also Maryland in the American Civil War: A History. Aftermath and Analysis: Because Maryland remained in the Union, it was exempted from the anti-slavery provisions of the Emancipation Proclamation (The Emancipation Proclamation only applied to states in rebellion). In 1864 the state held a constitutional convention that culminated in the passage of a new state constitution. Article 24 of that document outlawed the practice of slavery. In 1867 the state extended suffrage to non-white males. Maryland, as a slave-holding Border State, had remained relatively neutral toward the south in the antebellum arguments over states’ rights and the sovereignty of the Federal government. 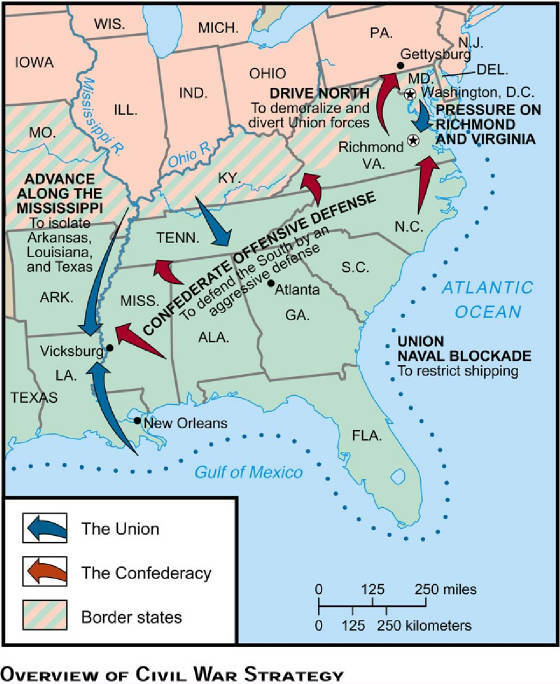 However, in the lead up to the American Civil War, it became clear that the state was bitterly divided in its sympathies. There was much less appetite for secession than elsewhere in the Southern States, but Maryland was equally unsympathetic toward the potentially abolitionist position of Republican candidate Abraham Lincoln. In the presidential election of 1860, Lincoln won merely 2,294 votes out of a total of 92,421, or only 2.5% of the votes cast. (About) The Battle of Antietam on September 17, 1862 — the single bloodiest day of the American Civil War and all of American military history, with nearly 23,000 casualties. However, across the state, sympathies were mixed. Some northern Marylanders such as John Wilkes Booth and General James J. Archer were pro-Confederate. "The President, under the Constitution and laws of the United States, cannot suspend the privilege of the writ of habeas corpus, nor authorize any military officer to do so". The immediate impact of Merryman was however rather limited, as the government and the Army simply ignored the ruling. After the occupation of the city, Union troops were garrisoned throughout the state. Several members of the Maryland legislature were also arrested. By late summer Maryland was firmly in the hands of Union soldiers. Arrests of Confederate sympathizers soon followed causing many Marylanders to flee to Virginia. Personal property was confiscated by the Federal government, while civil authority in Baltimore was swiftly withdrawn from all those who had not been steadfastly in favor of the Federal government's emergency measures. Thousands of Union troops were stationed in Charles County, and the Federal government established a large, unsheltered prison camp at Point Lookout at Maryland's southern tip where thousands of Confederates were kept, often in harsh conditions. Point Lookout is located at a peninsula formed by the confluence of the Chesapeake Bay and the Potomac River at the southern tip of St. Mary's County, Maryland. In 1862 during the American Civil War, much of the land around Point Lookout was transformed into a bustling port, temporary city of civilians and military personnel and numerous buildings, a large army hospital, an army garrison at Fort Lincoln, and a Union prison to hold Confederate prisoners of war. Of the 50,000 soldiers held in the Union prison, aka Union prison camp, between 1863 and 1865, according to the Maryland Department of Natural Resources, nearly 4,000 died. The camp, originally built to hold 10,000 men, swelled to as many as 20,000 prisoners after the exchange of prisoners between armies was halted. It was the largest Union prison in the North. See also Maryland in the American Civil War: A History. *65,000 is an estimate since, depending on the source, totals vary slightly. Estimates for Maryland, furthermore, range from 60,000 to 70,000 Union troops, which would include the following: Volunteers, Militia, Marylanders serving in U.S. units (referred to as "regulars"), Navy, Marines, and nearly 9,000 colored troops. The Union Army, vol 2, p. 270, states the following: "From the beginning to the close of the war Maryland furnished twenty regiments and one independent company of infantry; four regiments, one battalion and one independent company of cavalry; and six light batteries — a total of 50,316 white troops — and six regiments of colored infantry, numbering 8,718 men. In addition to these volunteers the state furnished her due proportion to the regular army of the United States and 5,636 men to the navy and marine corps." Sources: The Union Army; National Park Service; Library of Congress; National Archives; Official Records of the Union and Confederate Armies; Maryland State Archives (16 Sept. 2004). Historical Chronology; Dennis C. Curry (2001). "Native Maryland, 9000 B.C.-1600 A.D."; Whitman H. Ridgway. Maryland Humanities Council (2001). "(Maryland in) the Nineteenth Century"; David Hein, editor. Religion and Politics in Maryland on the Eve of the Civil War: The Letters of W. Wilkins Davis. 1988. Rev. ed., Eugene, OR: Wipf & Stock, 2009; Kurz & Allison. Copyrighted 1888 by Kurz & Allison, Art Publishers, Chicago, U.S.A.